The Israeli Diamond Industry is again preparing a major presence at HKTDC’s Hong Kong International Diamond, Gem & Pearl Show this year. The Israel Diamond Pavilion, organized by the Israel Diamond Institute Group of Companies (IDI), will host 70 companies. There will also be 10 Israeli companies exhibiting in other locations throughout the show. Among the Israeli exhibitors there will be four companies that are participating in this show for the first time. This year for the first time the Israel Diamond Pavilion will hold an auction of special stones offered by Israeli exhibitors. The goods will be on view and bids may be placed during the first two days of the exhibition, February 27 – 28. Progress on the bidding will be shown on screens located within the pavilion. The Israel Diamond Pavilion will measure over 1,000 square meters and will be located in the Diamond Hall at the AsiaWorld-Expo. A spacious lounge will offer a place to relax with refreshments served throughout the day. 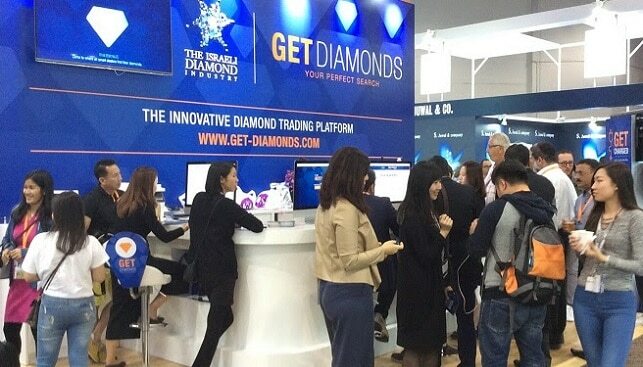 “Get Diamonds Show” terminals will enable buyers to search a computerized database in both English and Chinese of all goods offered by Israeli exhibitors at the show. Buyers are also able to access the Get Diamonds Show system on their smartphones. Hong Kong is Israel’s second largest market for polished diamonds, representing close to 30% of total polished diamond exports. In addition to this show, IDI organizes national pavilions in three trade shows in Hong Kong every year – in June, September and November. While Hong Kong is the major market Israel also supplies polished diamonds to China, India, Thailand, Singapore, Taiwan, Japan, Australia and other Far Eastern markets.